We can blame the parents all we want but that's not going to help little Yau, who was taken from Goh Ying Ying and hubby Yau Kok Kang when they left the 6-year old and their two other little kids in the car last Wednesday to check out a shop in Putra Heights. It will also not stop other parents from making the same mistake and paying dearly for it. In my years as a journalist and working with like-minded people to set up the NURIN Alert that evolved into today's NUR Alert, I've seen parents make the same mistake over and over. Sometimes the child is found and sometimes the child is lost forever. 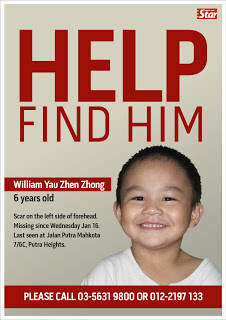 Yau's parents must not lose hope and we must not stop praying for their boy's safe return. Now returned to the maker forever. RIP.